Trusted by parents and doctors for over 50 years to be effective on pain & fever, while being gentle on the tummy. Comes with SIMPLEMEASURE® - a dosing technology specially designed to improve accuracy and reduce the potential for spills. 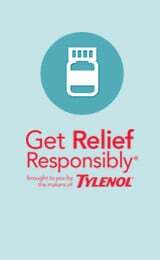 You should only take one medicine with acetaminophen at a time. Use our medicine checker to ensure you are taking medicine responsibly. Do not give your child more than directed (see liver warnings). Infants up to 23 months: SHAKE WELL BEFORE USE. For accurate dosing, follow instructions carefully. Use enclosed syringe and find the right dose on the chart. If possible, dose by weight, otherwise use age. Use only the syringe provided. Dispense liquid slowly into child’s mouth or mix with any liquid or soft food. Single dose may be repeated every 4 to 6 hours, as needed. Do not give more than 5 doses in 24 hours. sodium benzoate, sorbitol, water, xanthan gum. if your child is allergic to acetaminophen or any other ingredient in this product. If you are not sure whether a drug contains acetaminophen, ask a doctor or pharmacist. KEEP OUT OF THE REACH OF CHILDREN. In Case of Overdose: Call a Poison Control Centre or doctor immediately. Quick medical attention is critical even if you do not notice any signs or symptoms. Do not use if carton is open or if bottle neck band is missing or broken. Acetaminophen is great for pain relief but not a proprietary drug. I like the syringe and the ease of dispencing, the dye-free option and the clear instructions. I not like the corn syrup or sorbitol and it gives my baby horrible gas. Can't they make a completely unsweetened version? Thank you for sharing your review with us. We're so sorry to hear you had this experience with our Infants' Drops. We'd like to learn more and help to make this right. Please give us a call at 1-800-265-7323, Monday-Friday from 9a-5:30p ET. We hope to hear from you soon! when my daughter was teething we used this. it worked pretty fast and mommy & baby got a good nights rest. Great for infants pain for shots and teething pain. Both my kids didn't mind the taste. We love to use this for our daughter when she is teething. She doesn’t mind the taste so it’s easy to give to her, it’s awesome to have the measuring syringe in the package because other brands don’t have that and it’s definitely the most effective medicine we’ve given for teething relief! Why does it say sugar free when it contains corn syrup? Unclear what the difference between this product and the fever and sore throat pain one is, as they have identical ingredient lists. Works well. Used it when my kids were babies. I found this worked well. Liked that it was dye free. Consumer Healthcare, division of Johnson & Johnson Inc.
Last updated: February 5th, 2015.